Malaysia Airlines has become the first Malaysian carrier to receive the International Air Transport Association Fast Travel Green certificate in recognition of the airline’s efforts in making passengers’ travel more flexible and convenient via its self-service facilities. IATA’s Fast Travel Programme covers six areas of passenger travel which includes check-in, bags ready-to-go, document check, flight re-booking, self-boarding, and bag recovery. Airlines will then be ranked on the usage of these services by IATA. By 2020, IATA aims for 80 per cent of global passengers to be offered a complete self-service suite throughout their journey, based on IATA’s industry standards. Under this programme, Malaysia Airlines has earned the Green ranking by meeting five of the requirements which are check-in, bags ready-to-go, flight re-booking, self-boarding and bag recovery. 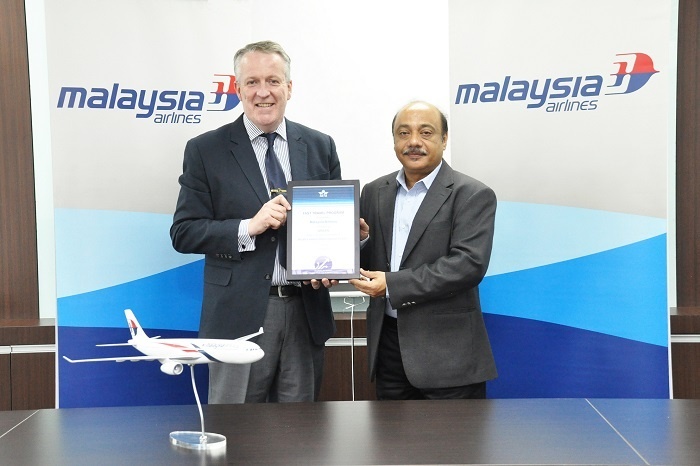 The certificate was presented by Sunil Chopra, IATA area manager for Singapore, Malaysia, Brunei, Bangladesh, Sri Lanka and Maldives, to Malaysia Airlines chief executive, Peter Bellew, at the airline’s head office in Sepang. The services are in line with Malaysia Airlines’ strategy to leverage on technology in order to simplify and reduce the time for check in, giving customers more control over their travel experience. The airlines is already working towards Gold status which will require the implementation of the self-service travel document verification to passengers.